Well, Memorial Day is going pretty well, and naturally I have some thoughts regarding poached eggs. 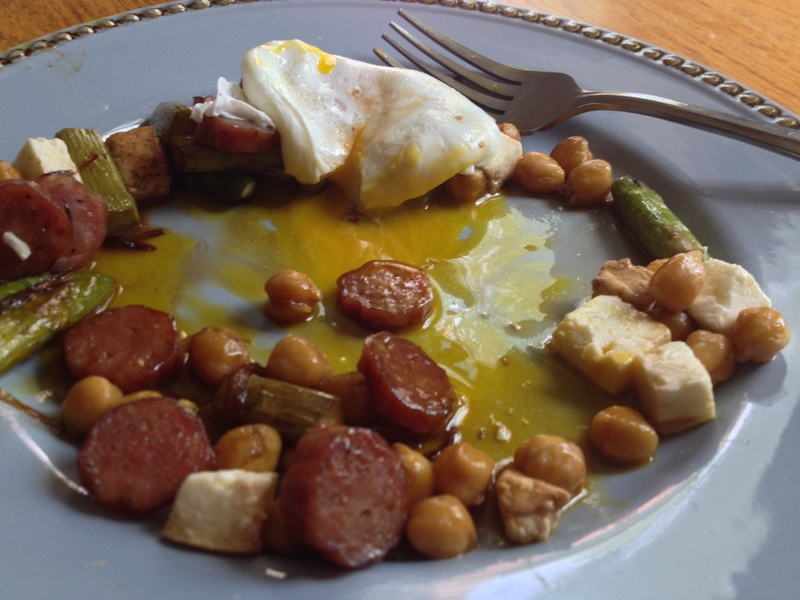 Here’s a strange breakfast stir-fry I made today, featuring a poached egg. 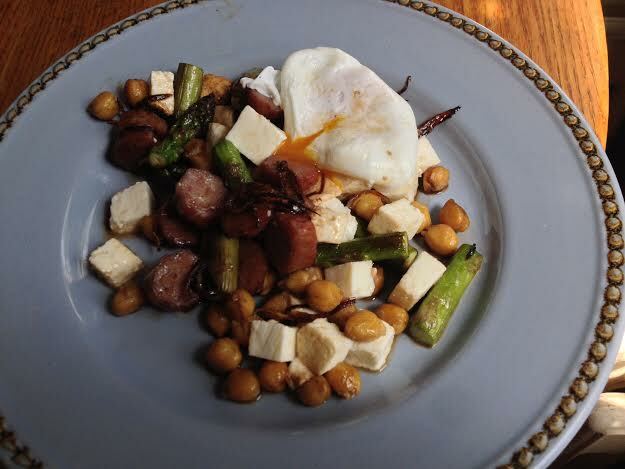 It was made of seemingly disconnected things I had around (smoked kielbasa, queso fresca, asparagus, garbanzo beans, shallot & balsamic vinegar). It looked like hell, but it was food. I’ve never particularly given a crap about poached eggs. I have plenty of crap to give to plenty of egg, but there were only a couple left for poached eggs. Then I became annoyed with how the world all screamed with excitement at the same time regarding poached eggs. I didn’t think it was such a problem except for it was maligning the fried egg, and not letting it have enough time in the sun. Fried eggs look like suns and taste like butter; poached eggs look like deep sea creatures and taste like water. I didn’t want people moving along to something so strange, so quickly. 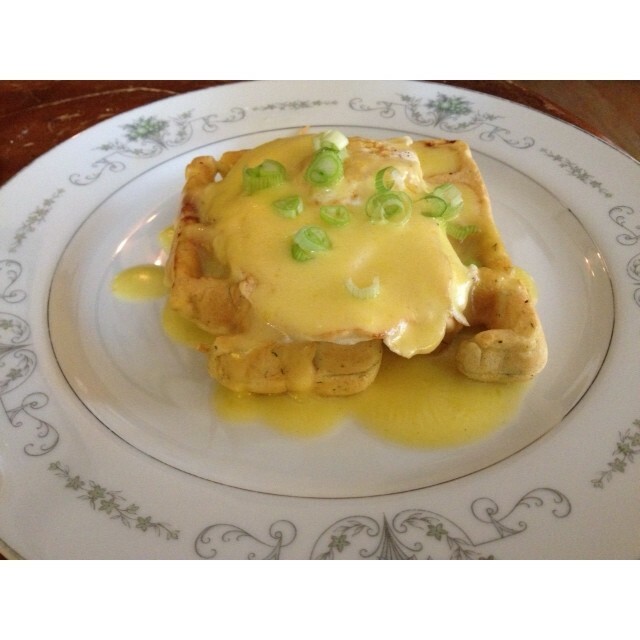 Here’s a picture of the sturdy and unassuming fried egg, atop a waffle & covered in hollandaise. I know. You can’t really see it. I promise it’s there, lending a hand to flavor. This is what we ate for Thanksgiving last year. If you can’t tell where this is going: As of now, I like poached eggs. My friend loaned me Mind of a Chef, and I watched David Chang pierce poached egg after poached egg with a paring knife, and I got excited about it every time. Also, he’s poaching an egg INSIDE THE SHELL (see: devil magic) in a warm water-bath, so he can crack the shell, and out comes a beautiful, slimy oval of joy. I was feeling too hungry to set up a water bath, so I got a pot of water a-boiling and cracked an egg in there. It was satisfying to eat, and loads of fun. I don’t like the way poached eggs taste more than fried eggs , however I like them because they can bleed all over your other food while you eat. They sit wherever you’ve perched them on the plate, and peacefully ooze throughout the meal. When else do you get a little constant sauce dispenser during your meal? Imagine how many salads you could sell if you put the dressing inside a poached-egg type structure, and people could slowly have ranch dressing ooze onto their greens as they ate? I know that sounds freaky, but this might be my million dollar moment. Regarding the picture above: I wish more people would post pictures of half-eaten food. That should be my next blog: Half-Clean Plate Club. You can learn a lot about food at the half-way stage. And because I’m so full of good spirits for the holiday, I asked my poet-friend Vicky Tuckville to share her thoughts on poached eggs.